"Maintained by minor tech legend Jim Taylor, it's not your typical FAQ. Outside of The Starr Report, it just might be the most thorough document known to man--though hardly as prurient." The UltraViolet FAQ is up! UltraViolet is the upcoming system for buying, download, and streaming movies over the Internet. More information in Jim's new UltraViolet FAQ. 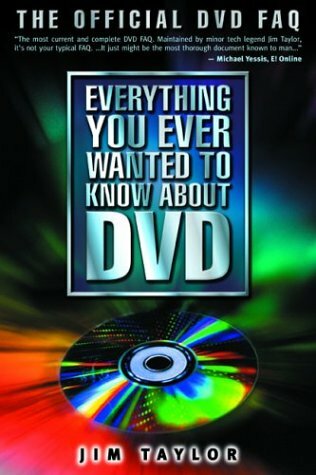 Blu-ray Disc Demystified was published in November 2008. Blu-ray has been given the "Demystified" treatment with details on development, physical format, logical formats, applications, myth busting, advantages/disadvantages, and more. More information at the BDDemystified Web site. Jim has been joined by renowned DVD developer Mark Johnson and award-winning video director Chuck Crawford to update DVD Demystified with details of the latest developments and formats. Detailed descriptions of DVD, HD DVD, Blu-ray Disc (BD), UMD, and more. Over 200 information-packed charts and figures, including a quick reference section. Clear and understandable explanations of features and technologies. Includes a DVD with samples from Broadcast DVD, Dolby, DTS, Joe Kane Productions, Microsoft, Ovation Software, THX, Widescreen Review, and others, plus WebDVD HTML files, spreadsheets, and more. Order online from Amazon.com (U.S.) or Amazon.ca (Canada). If you're on the other side of the pond, order online from Amazon.co.uk. DVD Demystified 2nd edition is available in Japanese. Download barcodes for using the DVD Demystified disc with Pioneer 7400/7300/7200 industrial players. This is the DVD FAQ in print. If you've ever wished you had a copy of the FAQ to read on the bus, at breakfast, or in the bathroom, your wish has been granted. DVD FAQ - The official Frequently Asked Questions list of the rec.video.dvd newsgroups. Reader comments about the DVD FAQ. ChangeDetect will tell you when the DVD FAQ is updated. DVD 101 and Then Some - Article from my appearance on Leo Laporte's Call For Help TV show. Top DVD Myths (mirrored at DVD Review). Anneke Taylor and Corwin Taylor. The music of James Taylor. He has his own FAQ. The official site of Jim Taylor, Football Hall of Famer. DVD Authoring and Production, by Ralph LaBarge. Takes up where DVD Demystified leaves off, explaining the ins and outs of producing, distributing, and selling DVDs. A Technical Introduction to Digital Video, by Charles Poynton. Very technical, but excellent and authoritative. Digital Video and HDTV: Algorithms and Interfaces, by Charles Poynton. Supersedes A Technical Introduction to Digital Video. Principles of Digital Audio, 4th ed, by Ken Pohlmann. The top technical introduction to CD and digital audio. The Art of Digital Audio, 3rd ed, by John Watkinson. The Art of Digital Video, 3rd ed, by John Watkinson. MPEG-2, by John Watkinson. A good overview of digital audio, digital video, and MPEG-2. Digital Video: An Introduction to MPEG-2 by Barry G. Haskell and Arun N. Netravali. An understandable technical introduction to MPEG-2. CD-R/DVD Disc Recording Demystified, by Lee Purcell. A guide to burning CDs and DVDs. DVD Demystified is hosted by the excellent SiteGround. Sign up for hosting services at SiteGround and Jim will get a discount on the cost of hosting this site.